The last snow before today was on Christmas, so it’s been a really bizarre Utah winter. 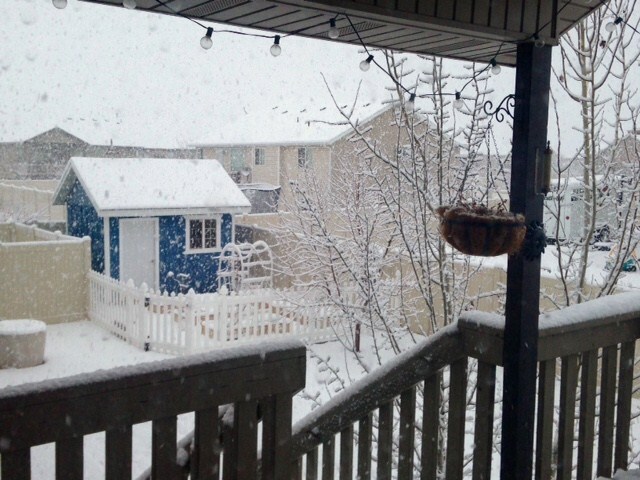 I generally am not a winter person, and was hoping that by March we could forgo snow in the valleys and just get a lot of spring rain to make up for the lack of moisture. No such luck, but at least the snow makes everything beautiful! Since I start a lot of my plants from seed, it’s time to start thinking about planning my garden this year, which to be honest I’ve been doing for a month. I just get so excited about the possibilities, and I love to grow things. I feel like little sprouts and baby plants indoors kind of connects me to nature even when I’m inside. I will be using some simple fluorescent lights hanging from chain and S-hooks above each shelf. Grow lights are just one cool bulb and one warm bulb – nothing complicated. I will use the timer we use last year so we can change the length of time the bulbs are on easily and not have to worry about turning them on and off each day. In terms of what I’m planting, I have a lot of space to fill. In addition to the raised beds in front of the shed, I have a large L-shaped section of garden to work with in our RV pad, which is at least 300 SF. I could carve out more space at any time, but I like the manageable size I’ve got for now. The larger plot in the RV pad is perfect for plants that just tend to take over like squashes and tomatoes – they get huge and require a lot of room. That plot also happens to get a lot of sunlight. The raised beds are perfect for more compact things like greens, root veggies, onions, and plants that grow upward on trellises. Additionally, I will be starting some violets, nasturtiums, and marigolds from seed to plant around and between the veggies. They make the garden prettier by adding color, and help keep pests away. And my herbs are all over the yard, under trees, in pots, etc. Most volunteer from year to year at this point, but I do throw down some seeds. They are the easiest to grow (for me) so I don’t put a lot of effort into planning for them. But I tend to have: mint, basil, oregano, thyme, cilantro, rosemary, and chives. To plan my garden and make sure I have enough space for what I want, I just sketch it out. 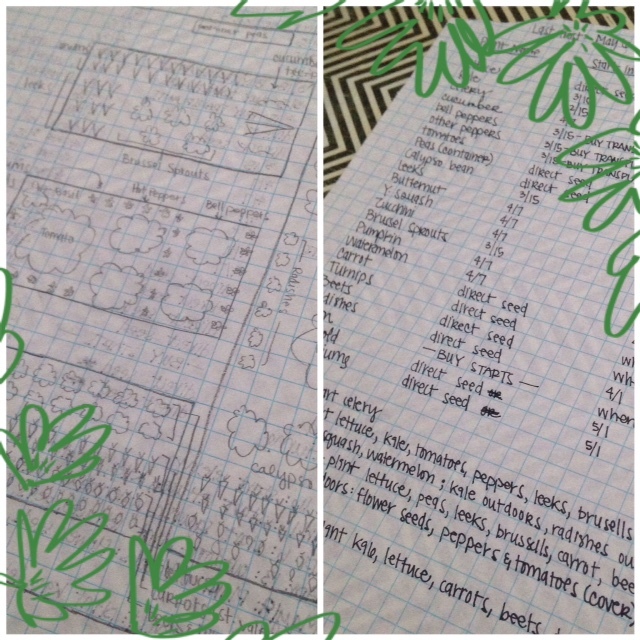 There are a ton of websites and apps you can use to plan a garden, but I think it’s easier to use graph paper and doodle it out, minding the spacing requirements. I also use Google to make sure my plants are compatible with their neighbors – I can never remember from one year to the next, but it’s an easy enough search. Then I list all the seeds I need to start and their germination time. Counting days to germination backward from our zone’s last freeze date, I write down when I need to start each variety indoors or direct seed, when to put the seedlings outside, and when to plant them in the ground (making notes that might be helpful). Then I mark all those things on my calendar. It’s a totally paper system, but it works. I keep the notes in our household binder under its own section. One other thing of note: I save all my rough plans and notes for the next year, so I can also make sure to not plant the same thing in the same bed two years in a row (it’s amazing how hard it is to remember). This ensures the soil isn’t being depleted of nutrients. The whole planning process here takes a couple of hours max, but saves me tons of time and frustration later. I’ve ordered all my seeds from Seed Savers Exchange for the last couple of years, and this year I did the same. But I also ordered pepper and tomato starts this year, which I haven’t done before. They will not ship them until closer to planting time for my zone, which I really like. They are a great company and I really recommend them! Thanks for reading about my boring garden planning process. Do you grow food? What are you planning for yard-wise this year?